The core values at IMS are not just words on a piece of paper, but are values our company puts into action. During this year's Fall Team Meeting, the entire company stepped away from the modular buildings and gathered near our office in Elkhart, Indiana to spend the morning giving back to the local community. 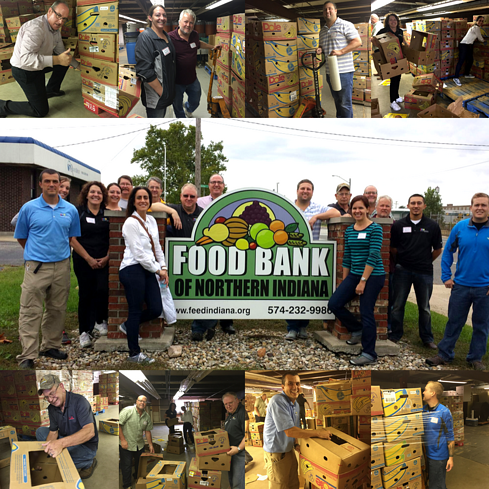 The Food Bank of Northern Indiana works in partnership with the community to feed the hungry, increase awareness of the effects of hunger and lead programs designed to alleviate hunger. The IMS team spent the morning learning about the many programs the food bank offers, and then worked together on various tasks around their facility, including prepping boxes to be filled with food before their next delivery. IMS looks forward to continuing to serve our local communities through our Giving Back initiatives. Check out photos from our last team volunteering at Feed My Starving Children.